7/4 Cup of Coffee: There were a trio of pitcher's duels on Thursday, with the Red Sox affiliates coming out on the losing side of all three. A former Sox draftee and an ex-prospect knocked off Pawtucket and Allen Webster (pictured), Greenville provided little support for Daniel McGrath, and the GCL Red Sox lost after matching zeroes for 10 innings. On the other end of the spectrum was the DSL Red Sox, who won with what resembled a football score. Lowell came out on top in its contest, while Portland was blown out. Salem's game was postponed by rain. It was an exciting pitching matchup in Pawtucket, with Allen Webster taking on the Rochester Red Wings (MIN) and top Twins prospect -- and 2008 Red Sox draftee -- Alex Meyer. The PawSox fell 2-1 to the Wings, despite a solid performance from Webster. He allowed just one run on two hits in 5 1/3 innings, striking out six and walking three. Miguel Celestino took the loss in his Triple-A debut, giving up a run on two hits in an inning and a third. Meyer, a 20th-round pick in 2008 who turned down big bonus money to attend the University of Kentucky, held the PawSox lineup in check. He allowed only three hits, and the only run came in the second when Christian Vazquez doubled and then scored on a Garin Cecchini single. Another old friend, Ryan Pressly (MIN), tossed three innings for the save. 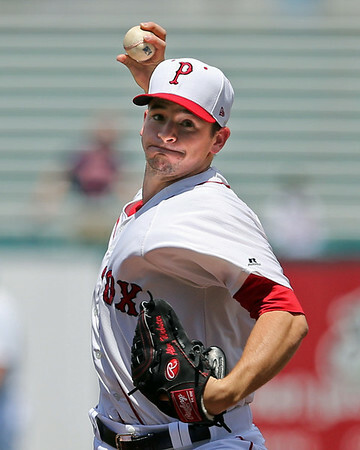 A 2007 11th-round pick, Pressly pitched five years in the Red Sox system before getting taken by the Twins in the 2012 Rule 5 draft. Little went right for Portland in its 8-0 loss to the Trenton Thunder (NYY). Trenton pounded Sea Dogs pitching for 15 hits, including 11 in four innings off of starter Mike Augliera. Augliera allowed six runs and struck out four without issuing a walk. Pete Ruiz made his return to Portland, and allowed two runs on four hits in three innings. He held the Thunder scoreless in his first two innings of work, but surrendered a two-run homer in the seventh. Meanwhile, Portland generated little at the plate. David Chester was the only batter to reach base more than once, going 1 for 3 with a walk and a double. Salem's contest against the Frederick Keys (BAL) was postponed due to rain. It will be made up as part of a doubleheader on August 27. Greenville dropped a 3-1 decision to the Asheville Tourists (COL) despite a very strong outing from Daniel McGrath. The Australian left-hander allowed two runs on six hits in a career-high seven innings. He walked one and struck out two. McGrath has come on strong after a shaky start to the season, posting a 1.90 ERA in his last four starts. Mike Adams allowed a run on two hits in two innings of relief, striking out two without walking a batter. Aneudis Peralta had two of the Drive's five hits. The first baseman was 2 for 4 with a double, scoring the only run of the night on a sacrifice fly off the bat of Forrest Allday. Tim Roberson and Kevin Mager also doubled for Greenville. Lowell knocked off the Connecticut Tigers (DET), 6-4. Simon Mercedes, on the Salem disabled list since June 11, made his first rehab start. The righty was sharp, giving up just one hit in three shutout innings, walking one and striking out one. Jason Garcia struggled in relief, allowing four runs on six hits in 2 2/3 innings. German Taveras was outstanding, striking out three in 2 1/3 hitless frames to earn the win. After allowing three runs in his first appearance of 2014, Taveras has given up just one in 12 innings across five outings. Carlos Pinales struck out two in a perfect ninth to earn the save. Every starter got a hit as part of the Spinners 13-hit attack at the plate. Sixth-round pick Danny Mars led the way, going 3 for 5 with a double and a run scored. Sam Travis was 2 for 4 with two RBI, and his first professional stolen base. Cisco Tellez also had a 2-for-4 night , adding a double and run scored. The GCL Red Sox and GCL Orioles matched zeroes for 10 innings until the Orioles broke through in the 11th, winning 1-0. Hits were hard to come by for both sides, as the two squads had only three apiece. Making a rehab appearance, Ty Buttrey struck out three in two perfect innings. The 2012 fourth-rounder has been on the disabled list since mid-May with a broken hand. With five shutout frames, Luis Ramos extended his scoreless streak to begin 2014 to 13 1/3 innings. The left-hander out of Panama struck out five and did not issue a walk. Carlos Garcia follwed with two hitless innings, with a walk and a strikeout. After a scoreless 10th, K.J. Trader's wildness cost him in the 11th. He walked the leadoff man, and uncorked a wild pitch, advancing him to second. A single moved the lead runner to third, and a second wild pitch of the inning scored the decisive run. The Sox lineup was punchless, delivering only three hits and never advancing a baserunner as far as third. One of the hits belonged to Javier Guerra, who extended his hitting streak to six games. In a game that was the polar opposite of the GCL contest, the DSL Red Sox pounded out 18 hits to beat the DSL Mariners by a touchdown, 20-13. Outfielder Jesus Perez had a monster game, going 4 for 4 and driving in six runs (note: Perez is mistakenly listed as pitcher Juan Perez in the DSL box score). He finished a home run short of the cycle, nothing a double, triple, walk and two runs scored. Yoan Aybar also doubled and tripled for the Sox, driving in three runs and scoring four. Samuel Miranda was 3 for 5 with a pair of doubles and three RBI, and Raiwinson Lamenda was 3 for 4 with a double, walk, and three runs scored. Ritzi Mendoza, who had allowed only three earned runs in his five previous appearances, gave up five runs on seven hits in four innings of work. Despite the rough outing, the 17-year-old Mendoza sports a solid 2.88 ERA on the year. Samir El Halaby was solid in relief to earn the win, giving up a run on just one hit in three innings, striking out two without allowing a walk. Player of the Day: Leading the way in the DSL Red Sox 18-hit, 20-run explosion, Jesus Perez had four hits including a double and triple. The six RBI matched the season total to this point for the outfielder, signed in May out of the Dominican Republic.